In recent years the buzzword “all electric” is becoming popular, which refers to kitchen appliances, water heaters, and other devices in the home all being supplied with electric power. Along with this, demand is growing for IH (induction heating) cooking heaters as a safer alternative to gas ranges. IH cooking heaters use large currents to generate strong thermoelectric power that is converted to heat. 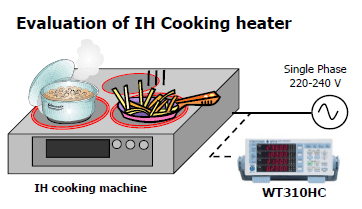 The large current flowing in an IH cooking heater can be input directly to the WT310HE without the need for current sensors or other devices, allowing measurement of voltage, current, power, waveform distortion (THD), and other parameters. Measurements can be taken at intervals as short as 100 ms, allowing for high speed acquisition of power data on manufacturing lines. Large current direct input: 40Arms. High Accuracy power consumption measurement:0.1% of reading. Harmonics (DC-50th order) and Total harmonic distortion (THD) can be measured. The WT310HE has MAX. 40Arms range for testing large current equipment like IH cooking machine. It can measure voltage/current/Power and THD (Total Harmonic Distortion) at same time. Therefore, evaluation period of IH cooking machine becomes shorter. On the other hands, in order to fit “frying pan and pot of all kind of metal material”, driven frequency of IH circuit becomes faster. The WT18000 is better for the evaluation because of its performance. IH cooking heater can be input directly to New power meter without the need for current sensors.